Why should I use Hydroponics? What are the different types of hydroponic systems available? What are the different types of hydroponic media? How do I build my own hydroponic system? Hydroponic gardening is easy and fun once the concept and principles are understood. There are a few basic rules that must be followed to make a good hydroponic system productive. First, let's look at how and why hydroponics works. In the basic hydroponic system, the inert soilless medium contains essentially no nutrients of its own. All the nutrients are supplied by the nutrient (fertilizer) solution. This solution passes over the roots or floods around them at regular intervals, later draining off. The extra oxygen around the roots is able to speed the plants' uptake of nutrients. Plants grow faster hydroponically because they are able to assimilate nutrients faster. They are able to take in food as fast as they are able to utilize it. In soil, as in hydroponics, the roots absorb nutrients and water; even the best soil rarely contains as much oxygen as a soilless hydroponic medium. Hydroponics works well for horticulturists who are willing to spend a few extra minutes a day in their garden. The garden requires extra maintenance. Plants grow faster and there are more things to check. In fact, some people do not like hydroponic gardening because plants grow too fast and require additional care. Hydroponic gardening can become overwhelming for the novice gardener if too complex of a system is implemented at first if you are a novice gardener and want to garden hydroponically, try setting up a basic system. Once you have gained experience and feel comfortable with hydroponics, move to a more elaborate system. Remember, if you buy all the new little hydroponic garden gadgets available, you may start more projects than you can manage effectively. If you are contemplating constructing and inventing your own unit, get your hands wet with a tried and true system first it will take a month or two to work out most of the bugs in a homemade unit. Hydroponic gardening is exacting and not as forgiving as soil gardening. The soil works as a buffer for nutrients and holds them longer than the inert medium of hydroponics. Some very advanced hydroponic systems do not even use a soilless mix. The roots are suspended in the air and misted with nutrient solution. The misting chamber is kept dark so algae does not compete with roots. This form of hydroponics is called aeroponics. Plants properly maintained, grown hydroponically under HID lamps tend to grow more lush foliage and at a faster rate than plants grown in soil. The real benefit with hydroponics is realized later in the plant's life. When roots are restricted and growth slows in containerized plants, hydroponically grown plants are still getting the maximum amount of nutrients. The above is an excerpt from George Van Patten's book, "New Revised Gardening Indoors". Please see our Online Store for the rest of the books that we carry from Van Patten Publishing. The nutrient film technique was developed in the mid 1960s in England by Dr. Allen Cooper. He was interested in building a low cost, large scale system to be used in parts of the world where soil quality is poor. NFT ensures a continuous flow of nutrient laden solution over the root system, allowing the plants to feed constantly, resulting in increased productivity and yield. NFT systems use little or no growing medium, thereby keeping operating costs down, but because of the lack of medium to act as a buffer, plants may suffer if a long-term power failure occurs. Trellising may be required when growing larger plants in NFT systems because of the lack of medium to hold the plants in place. An Ebb and Flow system consists of a growing bed in which individual containers filled with medium hold your plant's root systems. The growing medium also acts as a buffer, holding water and nutrients around the root system, and reducing the risk of crop loss due to power or equipment failure. The growing bed is flooded periodically to feed and water the plants and allowed to drain freely to pull oxygen into the root zone. Ebb and Flow systems' low maintenance, high productivity, and ease of use make them among the most popular hydroponic systems for not only the beginner, but for the advanced gardener as well. A top feed or drip system operates by using a pump and tubing to deliver nutrient solution to the top of the growing medium, where the solution trickles through the medium and then returns to the reservoir. Top Feed systems can use a variety of growing media and are available in a wide range of configurations. Top Feed systems are reliable, require little maintenance, and are suited for all types of plant growth. Aeroponics systems use pumps and sprayers to continually spray oxygen rich nutrient solution directly onto the root systems of your plants. Aeroponic systems have shown extremely fast growth rates and clone- rooting success rates due to the large amount of diffused oxygen available in the nutrient solution. These systems successfully propagate very hard to root plants. Very little growing medium in these systems reduces operating costs. An Air Pump system utilizes a small air pump of the type used in an aquarium to constantly circulate oxygen-rich nutrient solution through the growing medium. This method of hydroponics does supply more dissolved oxygen to the root system of the plant than other methods can, although not as much as the aeroponic method does. Air Pump systems are available in a variety of configurations and sizes. Rockwool is a fairly recent addition to the types of growing mediums available on the market. This sterile, porous, nondegradable medium is composed primarily of granite or limestone which is melted and spun like cotton candy. Rockwool is then formed into blocks, sheets, cubes, slabs, or flocking. Rockwool absorbs moisture without holding nutrients, and even when it is completely saturated still retains 20% air for your root system. L.E.C.A. stone is a type of clay which is super-fired to create a porous medium. It is also heavy enough to provide secure support for your plants' root systems. This non-degradable, sterile growing medium holds moisture, has a neutral pH, and also will wick nutrient solution to the root systems of your plants. L.E.C.A. is often the growing medium of choice of novices and professionals alike because it is easy to use. Perlite is primarily composed of minerals subjected to intense heat which expand and become very absorbent. This material is light, has a neutral pH, excellent wicking action, and is very porous. Perlite is used in a wide variety of hydroponic systems because of its ability to hold moisture and nutrients as well as air, and also because it is very easy to use. An alternative to using rockwool, Coconut fiber is the first "organic" medium to offer high performance in modern hydroponic applications. Coconut fiber can also be added into soil mixtures to increase water holding capacity. Coconut fiber holds more oxygen than rockwool and is pH neutral. Available as compressed bricks, when Coconut fiber is soaked in water it expands to 6 times its compressed size. Many growers have found that a 50/50 mix of coconut fiber and L.E.C.A is the perfect organic medium. Over twenty elements are needed for a plant to grow. Carbon, hydrogen and oxygen are absorbed from the air and water. The rest of the elements, called mineral nutrients, are dissolved in the nutrient solution. The primary or macro-nutrients (nitrogen (N), phosphorus (P) and potassium (K)) are the elements plants use the most. Calcium (Ca) and magnesium (Mg) are secondary nutrients and used in smaller amounts. Iron (Fe), sulfur (S), manganese (Mn), boron (B), molybdenum (Mo), zinc (Zn) and copper (Cu) are micro-nutrients or trace elements. Trace elements are found in most soils. Rockwool (hydroponic) fertilizers must contain these trace elements, as they do not normally exist in sufficient quantities in rockwool or water. Other elements also play a part in plant growth. Aluminum, chlorine, cobalt, iodine, selenium, silicon, sodium and vanadium are not normally included in nutrient mixes. They are required in very minute amounts that are usually present as impurities in the water supply or mixed along with other nutrients. The above nutrients are mixed together to form a complete plant fertilizer. The mix contains all the nutrients in the proper ratios to give plants all they need for lush, rapid growth. The fertilizer is dissolved in water to make a nutrient solution. Water transports these soluble nutrients into contact with the plant roots. In the presence of oxygen and water, the nutrients are absorbed through the root hairs. (N) is primary to plant growth. Plants convert nitrogen to make proteins essential to new cell growth. Nitrogen is mainly responsible for leaf and stem growth as well as overall size and vigor. Nitrogen moves easily to active young buds, shoots and leaves and slower to older leaves. Deficiency signs show first in older leaves. They turn a pale yellow and may die. New growth becomes weak and spindly. An abundance of nitrogen will cause soft, weak growth and even delay flower and fruit production if it is allowed to accumulate. (P) is necessary for photosynthesis and works as a catalyst for energy transfer within the plant. Phosphorus helps build strong roots and is vital for flower and seed production. Highest levels of phosphorus are used during germination, seedling growth and flowering. Deficiencies will show in older leaves first. Leaves turn deep green on a uniformly smaller, stunted plant. Leaves show brown or purple spots. NOTE: Phosphorus flocculates when concentrated and combined with calcium. (K) activates the manufacture and movement of sugars and starches, as well as growth by cell division. Potassium increases chlorophyll in foliage and helps regulate stomata openings so plants make better use of light and air. Potassium encourages strong root growth, water uptake and triggers enzymes that fight disease. Potassium is necessary during all stages of growth. It is especially important in the development of fruit. Deficiency signs of potassium are: plants are the tallest and appear healthy. Older leaves mottle and yellow between veins, followed by whole leaves that turn dark yellow and die. Flower and fruit drop are common problems associated with potassium deficiency. Potassium is usually locked out by high salinity. (Mg) is found as a central atom in the chlorophyll molecule and is essential to the absorption of light energy. Magnesium aids in the utilization of nutrients, neutralizes acids and toxic compounds produced by the plant. Deficiency signs of magnesium are: Older leaves yellow from the center outward, while veins remain green on deficient plants. Leaf tips and edges may discolor and curl upward. Growing tips turn lime green if the deficiency progresses to the top of the plant. (Ca) is fundamental to cell manufacture and growth. Soil gardeners use dolomite lime, which contains calcium and magnesium, to keep the soil sweet or buffered. Rockwool gardeners use calcium to buffer excess nutrients. Calcium moves slowly within the plant and tends to concentrate in roots and older growth. Consequently young growth shows deficiency signs first. Deficient leaf tips, edges and new growth will turn brown and die back. If too much calcium is applied early in life, it will stunt growth as well. It will also flocculate when a concentrated form is combined with potassium. (S) is a component of plant proteins and plays a role in root growth and chlorophyll supply. Distributed relatively evenly with largest amounts in leaves which affects the flavor and odor in many plants. Sulphur, like calcium, moves little within plant tissue and the first signs of a deficiency are pale young leaves. Growth is slow but leaves tend to get brittle and stay narrower than normal. (Fe) is a key catalyst in chlorophyll production and is used in photosynthesis. A lack of iron turns leaves pale yellow or white while the veins remain green. Iron is difficult for plants to absorb and moves slowly within the plant. Always use chelated (immediately available to the plant) iron in nutrient mixes. (Mg) works with plant enzymes to reduce nitrates before producing proteins. A lack of manganese turns young leaves a mottled yellow or brown. (Z) is a catalyst and must be present in minute amounts for plant growth. A lack of zinc results in stunting, yellowing and curling of small leaves. An excess of zinc is uncommon but very toxic and causes wilting or death. (C) is a catalyst for several enzymes. A shortage of copper makes new growth wilt and causes irregular growth. Excesses of copper causes sudden death. Copper is also used as a fungicide and wards off insects and diseases because of this property. (B) is necessary for cells to divide and protein formation. It also plays an active role in pollination and seed production. (Mo) helps form proteins and aids the plant's ability to fix nitrogen from the air. A deficiency causes leaves to turn pale and fringes to appear scorched. Irregular leaf growth may also result. The above text is an excerpt from George Van Patten's excellent book "Gardening Indoors with Rockwool". Please see our Online Store for a complete listing of the books from Van Patten Publishing that we carry. 1. Electro-Conductivity (EC) or Conductivity Factor (cF) can be expressed as either milliSiemens (mS), cF, or parts per million (PPM) 1 mS = 10cF = 700ppm. 2. The pH and electro-conductivity values specified here are given as a broad range. It should be noted that specific plant requirements will vary according to regional climatic conditions, and from season to season within that region. 3. As a general rule, plants will have a higher nutrient requirement during cooler months, and a lower requirement In the hottest months. Therefore, a stronger nutrient solution should be maintained during winter, With a weaker solution during summer when plants take up and transpire more water than nutrients. 4. KNOW YOUR CROP. Plant EC or cF may vary according to the stage of growth. For example, cucumber prefer 20cF when establishing, and 25cF after the first harvest. Between 5 and 7 weeks after first harvest, the optimum cF is 17. 5. The nutrient solution should be discarded at regular intervals. Should there be a requirement to flush the growing bed, the system should be flushed with fresh nutrients (run-to-waste) rather than water to avoid starving or stressing plant. The following are links to charts for pH / PPM / cF for different plants grown in hydroponics. Yes, you can build your own hydroponics system. We supply a variety of trays, pumps, filters, reservoirs, and other pieces that make building your own custom system a breeze. There are also many different types of hydroponic systems that are easily built from common parts that are usually readily available. Below we have illustrated a simple ebb and flow system made from components that we sell. Also, we have included a list of common pieces that can be found locally to build this system. 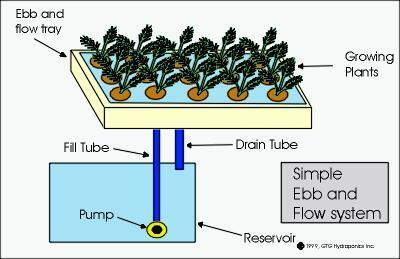 An ebb and flow system is one of the easiest hydroponic systems to build yourself. Many of the parts needed can be found locally, if not we carry a complete line of ebb and flow trays, NFT channels, reservoirs, hydroponic pumps and filters, fill and drain kits, etc. The principle behind an Ebb and Flow system is easily understood. A bottom reservoir contains nutrients which are periodically pumped up to the ebb and flow tray, and then allowed to drain via gravity back into the reservoir. When the Ebb and flow tray is flooded plants receive nutrients and water, also CO2 is pushed out and away from the plants root system. When the nutrient solution drains back into the reservoir, fresh oxygen is pulled down into the root system. This combination of fresh nutrients, water, and oxygen is then readily assimilated by the plants, ensuring lush healthy growth. Following is a list of parts that could be used to build an ebb and flow system out of componenets that we sell. Other alternatives are suggested below. 6. 3 hose clamps - 1/2"
Ebb and flow tray - Almost any non-tranparent plastic container may be used that will hold the weight of plants, medium, and water. Trays may also be wood that has been covered with heavy plastic. Make sure that the tray can drain completely, otherwise problems with root rot (pythium) can occur. Reservoir - May be a Rubbermaid container, Tucker Tote, plastic trash can, etc. Ensure that the container is clean, non see thru, and corrosion resistant. Do not use metal containers without a plastic liner, they will oxidize and could cause nutrient problems. 25+ gallons is recommended for the above system. Pump - May be an aquarium powerhead pump, at least 500 litres per hour is recommended for the above size system. Tubing - If an aquarium powerhead pump is used, 1/2" poly tubing should be used. Do not use clear tubing due to algae growth in tubing. Ebb and flow drain fitting - We sell an ebb and flow drain/fill kit for $12.00 that can be used in most situations, otherwise you can devise your own. Most ebb and flow systems will flow back through the fill fitting, using it as the main drain. Another drain will be set up as a standpipe/overflow, allowing you to adjust the water level in the tray by adjusting the height of the standpipe. An overflow drain is important to ensure that you do not have a flood in your growing area! Containers - Almost any plastic container may be used as long as proper drainage is ensured. Containers are not nessesary, the ebb and flow tray may be filled with medium and planted, but individual harvesting of plants is harder. Growing Medium - A variety of growing mediums is available including rockwool, LECA stone, perlite/vermiculite mix, etc. Many people use indiginous material such as sand, gravel and sawdust. Use these indiginous materials at your own risk, as some types of gravel and sand may have nutrients already present (thereby increasing your TDS) or could affect pH of your nutrient solution. Ensure that the tray will flood to the desired height. Depending on pot size and media, this is generally 1/2 -2/3 of the way up the side of the plant container. If planting directly into tray, flood enough that the root system is well watered every time the tray is filled. Do not allow water to go all the way up to the crown of the plant, which is where the plant stem starts out of the growing media. The tray must drain completely and have no puddles left after flood cycles, otherwise problems with pythium could happen. Make sure to install an overflow drain, so that if main drain becomes plugged system will not overflow. Flood the tray 2-5 times a day, depending on size of the plant. Each flood cycle should run at least 30% more nutrient thru the growing media than the media will absorb to provide a leaching effect which will help prevent salt build-ups in the growing medium. Do not run flood cycles for more than 30 minutes duration, otherwise root damage could occur. Change nutrient solution every two weeks or adjust according to tds. Check pH levels regularly, if pH or TDS goes out of range for your plants they will not maintain optimal growth.